Azure Search is a search as a service offering that gives developers total control over indexing and searching of their content. It’s the control that sets Azure Search apart from public search offerings such as Google Custom Search. With Azure Search you, the developer, define what, how and how often will be indexed and how search UI, search and suggestion results will look like. It will require more work on your side as a developer but it’s that trade-off you’re likely to make to deliver precisely the search experience for your applications you need. In this post I’m going walk you through adding search capabilities to your applications. I’m going to use my blog as a sample application. But be aware that Azure Search is not limited to web applications. It exposes its functionality through a set of RESTful services so it can be used from just about any application that speaks HTTP. It can be done either on the new preview portal or programmatically using Azure Management API. There are currently two pricing tiers: Standard (starts with $250/mo, dedicated resources, scalable up to 36 search units, up to 15 million documents per partitions, up to 12 partitions per service) and Free (shared resources, no scale, max 50Mb of storage, 10K documents and 3 indexes, enough for a blog ;)). This is the request body of the Create Index API. A .NET client library is available and you can use it to perform various actions against the search service (using ISearchServiceClient) and an index (using ISearchIndexClient). For a blog post you need such fields as Id (uniquely identifies a post), post title and content, post categories and a flag identifying if a post was published or not. The flag is needed so unpublished posts can be ignored with a filter. Field properties will of course depend on the application. In my example I’ve made only Id field retrievable, that is in the search result only Ids of posts will be returned which is enough as I will be able to get the rest of the post data directly from my storage if needed. Searchable property should be set to true on fields like Title, Content and Categories as I want to enable full text search over these fields. The only filterable field is IsPublished so I could exclude non-published posts. I don’t use sorting and facets which are useful in other types of applications. Notice the language analyzer that’s set for searchable fields. By default Azure Search will use a generic Lucene Standard Analyzer that’s capable of tokenizing and lowercasing strings. You can set language specific analyzers (for example, ‘en.lucene’ for English) that are capable of handling language specifics (removing trailing ‘s or stop words, etc). Also current version allows you to set Microsoft's natural language processors (the same technology that is used by Microsoft Office and Bing) as language analyzers that provide even better handling of various specifics of more than 50 languages. 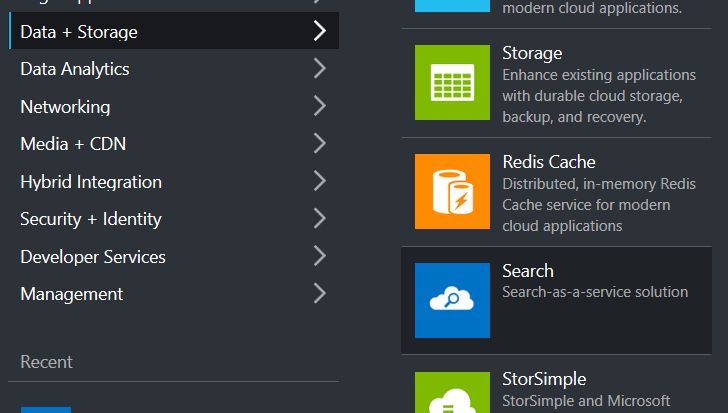 Currently data sources can be created for Azure SQL databases and DocumentDB. As my blog uses neither of them for storing posts I’m going fall back to the data push mechanism by sending my newly created and updated posts to Azure Search with HTTP POST requests. Even though a list of currently supported data sources may seem limited you can always post your documents for indexing directly. It will require a little more effort from your side but the key point is you are not limited by supported data sources. You can either use strongly typed documents or just generic Dictionary<string, object>. Note that at runtime you are better off implementing transient fault handling when communicating with remote services. Whenever a post is deleted I have to remove it from the search index as well. Filter = "IsPublished eq true"
Noticed that I search over published posts and specify that all search terms should be matched. I also make use of the really cool highlighting feature when the response will include text excerpts containing search terms and the terms will be surrounded with tags that you specify. You can directly show these excerpts (if they are present in the response) in the search result view or a suggester box. If highlights are not present, you can always get the posts by Id and decide what to display in the search result view. As you can see search results are ordered by the score and highlights may or may not be present so your rendering code should account for that.